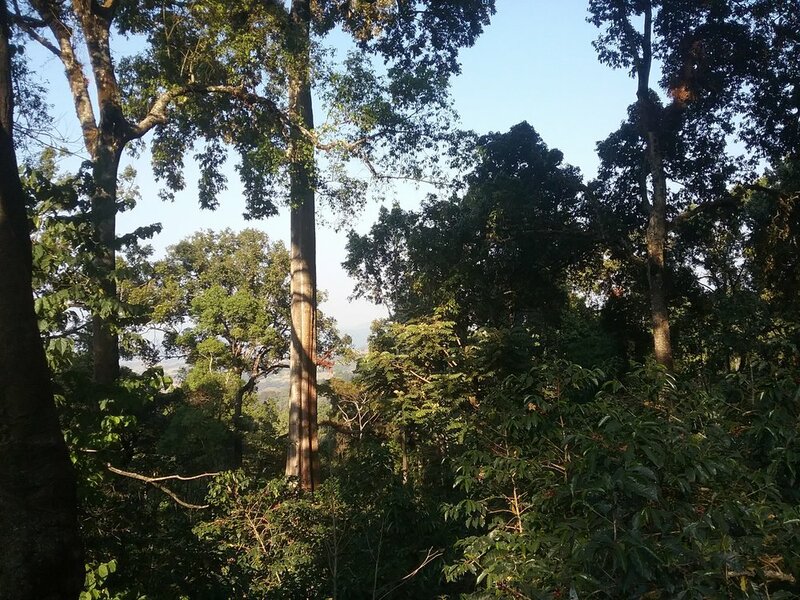 Limmu Kossa is an independently exporting coffee estate, privately owned and social in nature. For the third year, we are proud to work with the incredible Limmu Kossa Estate. We always thought that a direct partnership with an Ethiopian farm would be years away due to the country's notorious lack of trade transparency - but along along came Sara, Abiy and Giday to bring this beautiful coffee project to life. Sara Morrocchi had first heard of Limu Kossa while still working for Sustainable Harvest. It struck her attention because of the rare combination of traits: a private specialty coffee estate that could export directly and which was run by a man known for his passion and integrity in the local community: Gidey Berhe Retta, or as the locals call him: Abba Ollie ("the one who uplifts"). A friend of Gidey, Abiy Ashenafi - who represents Limu Kossa abroad - just so happened to live in The Hague, so when Sara moved to Holland they reconnected and met for coffee at Coffee Bru. It was soon clear that they spoke the same language when it came to coffee quality, community development and direct roaster involvement. After cupping some amazing harvest samples Sara introduced Abiy to Lennart at the World of Coffee in Budapest in 2017. The click between them was immediate as well and a partnership was born. Our pilot import from Limu Kossa (called "Galeh" after the microregion where it's from) was a major success and this season, we're proud to offer both natural and washed versions of this Ethiopian gem. We assure you that the average Ethiopian coffee value chain does not look so simple. The fact that Limu Kossa has its own export license warrants an unprecedented amount of transparency for this notoriously opaque coffee origin. Local varieties selected on productivity, strength and micro-region fit, called: 74165, 75227, 74140, 74110, 74112 and 5227. Limu Kossa is located in the highlands where the coffea arabica species evolved. 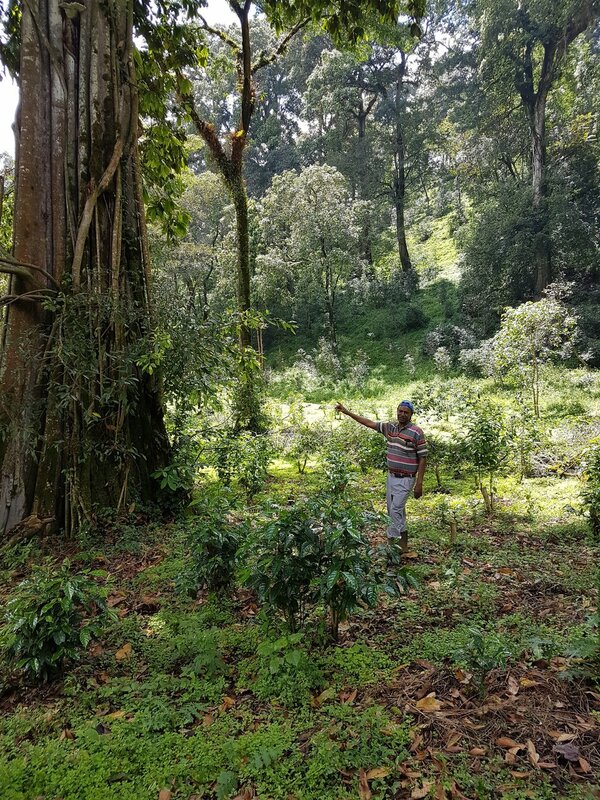 Limu Kossa is a private estate that extends its knowledge to surrounding farmers in order to be able to support them with higher prices and is an astounding example of agro-forestry where coffee grows as close to wild as commercially possible. 100% certified organic. 2017: partnership born, first microlot created for This Side Up, plans to export surrounding farmer lots established for next season. 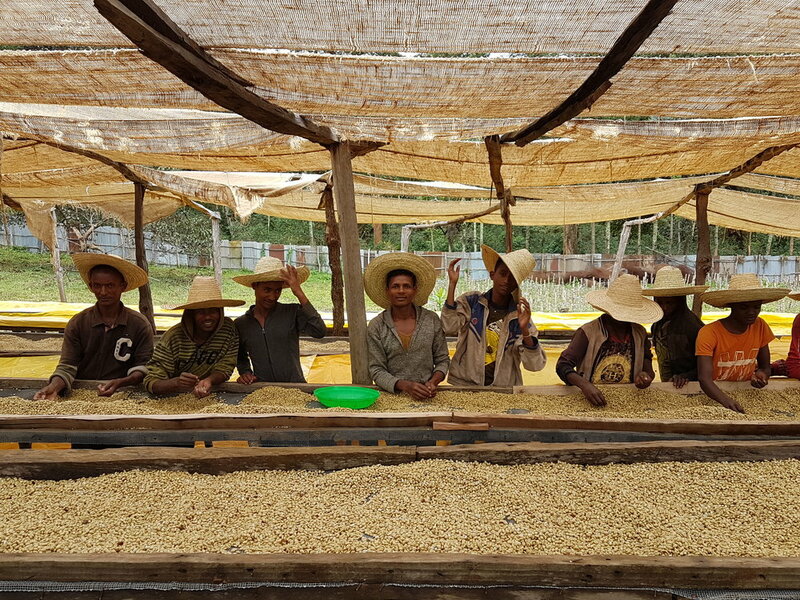 2018: naturals and washed lots of our Galeh microlot imported. Giday Berhe visited This Side Up on his second ever trip to Europe for the Producer Crossover and to create a thorough outgrower training program. fully washed: hand-picked, pre-sorted, floated, pulped, wet fermented for 12 hours, soaked and washed, dried on raised beds and dry-milled all under the supervision of the farm owner, Giday. the price you pay for this coffee p/kg. This Side Up agreed on € 6,28 p/kg for Limu Kossa's Grade 1 Galeh natural and washed lots. Cost of farming and harvesting + drying, done internally at Limu Kossa by their hired personnel. Milling in Limu Kossa's own facility + company expense coverage, personnel training costs included. Internal transport up to Djibouti and total shipping costs to Europe + customs. This Side Up compensation for spending time and resources importing this coffee. Our work includes building relationships with shipping and warehousing partners, managing export, import and shipping bureaucracy, Q grading, sampling and jointly promoting this coffee with Limmu Kossa. We found that to make this Ethiopian explode in flavour, our TSU Washed 2 profile (based on Tim Wendelboe's standard profile) works amazingly. Great balance between florals, fruity acidity and its heavier hazelnut notes. The new natural lot works beautifully with our natural profile. You may use these images freely to promote Limu Kossa and the Galeh microlot among your customers. Limu Kossa's owner is Gidey, an inspiring man who built an independently exporting estate from scratch. His friend and representative, Abiy Ashenafi, lives in the Netherlands and is fluent in Dutch and English. They are your main contacts for any questions about our Galeh project. Lennart, Sara and Abiy. The historic meeting that brought forth our partnership at the 2017 World of Coffee in Budapest. That is until Sara convinced Lennart to listen to the whole story of Giday and his company Limu Kossa. Sure they had an established business with state of the art equipment, and sure they had sold to specialty importers before - but appearances seldom tell the whole story. Fitsum immediately added: “the only problem with single farms is they tend not to allocate the premium price efficiently for the main purpose”. His experience with Technoserve showed him estates too could do much more to upgrade their processing, support surrounding farmers and become ecologically sustainable. One might add that in Ethiopia, there is a bit of a resource curse. Because the intrinsic (genetic) coffee quality is higher than literally anywhere else on Earth, processing standardisation has not been a priority nearly as much as in countries like Nicaragua or Rwanda - where our partners time every process to the minute to create specialty coffee. In Ethiopia, most farmers produce an 85+ coffee regardless of their attention to detail. Processing mistakes (or even lack of traceability and social justice) are forgiven easily - simply because the coffee is so damn good - and therefore buyers will come anyway. Of course, most of these buyers are not loyal and will easily switch if for any reason the coffee from one region is better than the other - one of the reasons that coffee farming, even in the best naturally endowed country in the world, is still risky and left to the country's poorest. So what to do? In a nutshell, coops are inexperienced and don’t deliver consistent quality and estates can’t be trusted to spend premiums fairly. When Sara introduced Lennart to Abiy and Limu Kossa at the World of Coffee in Budapest, she knew that he might hold the answer. Limu Kossa was founded by Giday Berhe. He started his coffee career as a trader in 1993 in Jimma. He then opened a wet and dry mill station with the aim to supply the central coffee market with quality coffee. In the early 2000s, he decided to establish his own farm in the village of Galeh in Jimma and from the outset establish meaningful relationships with neighbouring smallholder producers. Not only does he spend much of his profit on health care and schooling for the community, he actively teaches the farmers to upgrade their farms and techniques to eventually be able to process and export their coffee for high premiums as well. Here was the hybrid we were looking for, a private estate with the heart of a producer cooperative. His commitment to produce quality coffee while at the same time supporting his local community has even granted him the title of "Abba Ollie" or “he who uplifts”. It then dawned on us that we had heard similar titles for some of our other parters: Limu Kossa in fact resembles the structures we’re developing in Colombia and Nicaragua. All are private and well-organised support, milling and export entities that exist to uplift the lives of smallholder farmers. Today Limu Kossa is an established played in Jimma and known for both quality and commitment to social programs to improve livelihoods in the community. However, they have been struggling with marketing their coffee consistently to specialty buyers. Like us, they were looking for a partner who is willing to support them in their long-term plans to establish links with surrounding farmers and to allow them to export their coffee too. Through our work with Expocamo in Nicaragua and Argote in Colombia, we have the experience to set up such programs - but more exciting still, we can link Giday to these partners directly and provide very effective network support. We are happy to have our first pilot shipment of 35 bags in stock - halfway through the season this coffee is still as bright, floral and cherry-sweet as ever and is getting overwhelmingly positive responses. For next season, we can already reveal that Giday and Abiy are setting up six microplots according to microclimate, soil and altitude, and we’re planning a mini auction for the best of the harvest… Keep your eyes open for updates! Lennart visited the Limmu Kossa Estate in November 2018. We finalised the microregion lot program (divided into Betella, Suki and Suromo - parts of the form), met the three first outgrowers whose coffee we will separate and offer as distinct lots from now on. Created a cascara protocol and fine-tuned the natural drying process. Most of all we were truly astounded by the level of professionalism with which the farm is set up and maintained from an agro-forestry point of view. Also, the reverence that the locals have for Abba Ollie (which we have been writing about for two years but never experienced first hand!) is beautiful to see. We found great mutual respect between the him and the surrounding inhabitants of the area as well as the workers - people flock to the estate for work not just for the higher prices they receive, but for the good working and temporary living conditions at the farm. Lastly and most excitingly, we made plans to create an on-site cupping lab, maintained by local teens who will receive sponsored Q-grading training.